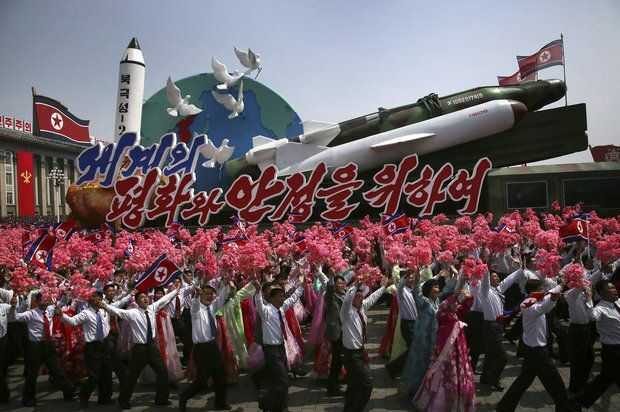 SEOUL, South Korea (AP) — North Korea on Sunday failed in a missile launch from its eastern coast, South Korea’s Joint Chiefs of Staff said, but it wasn’t immediately clear what kind of missile was fired. The missile blew up almost immediately, U.S. Pacific Command said, according to The Washington Post. The report added that the ballistic missile was fired “just minutes after Vice President Pence took off from Alaska” en route to South Korea, where he is expected to issue a warning to the North to stop its provocations. The explosion was seen as “deep embarrassment” for North Korea’s leader, Kim Jong Un, because the missile apparently was launched as a show of daring as U.S. war ships approached his country to deter provocations, The New York Times reported. The launch from the city of Sinpo comes a day after one of the biggest North Korean propaganda events of the year — celebrations of the 105th birthday of late North Korea founder Kim Il Sung, the current leader’s grandfather. North Korea regularly launches short-range missiles, but it is also developing mid-range and long-range missiles meant to target U.S. troops in Asia and, eventually, the U.S. mainland. North Korea launched a long-range rocket and conducted two nuclear tests last year, including its most powerful to date. Its eventual goal is a long-range nuclear missile that can strike the continental United States. Another missile test from Sinpo failed earlier this month, when the rocket spun out of control and plunged into the ocean. That launch came shortly before U.S. President Donald Trump’s first meeting with Chinese leader Xi Jinping. China is North Korea’s only major ally. Despite Sunday’s failure, the North’s previous claim to have used “standardized” warheads has led to worries that it was making headway in its push to develop small and sophisticated warheads to be topped on long-range missiles. The United States, South Korea and other countries have vowed to apply more pressure on the North, but so far nothing has worked to stop Pyongyang’s nuclear program.